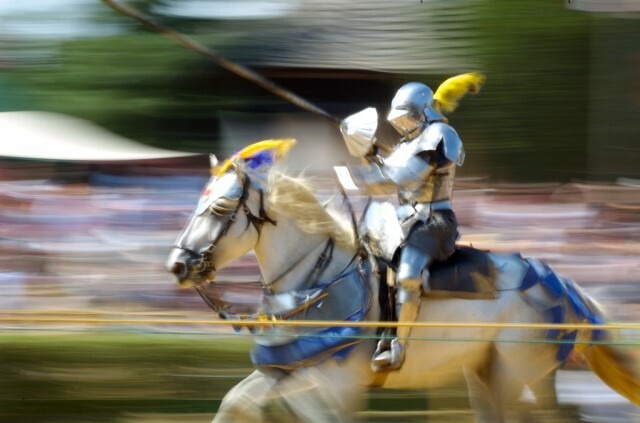 It is a scene ideally suited for Medieval times. A dark knight adjusts his visor, raises his lance and focuses, laserlike, on his opponent, the “white” knight, sitting astride his mount. The flag goes down and they charge, lances straight, bodies tensing against the weight of their custom-fit armor — often 200 pounds of solid steel. The bout, though, isn’t old; it’s happening at the Scottish Highland Games & Celtic Music Festival in Mississippi in November. And lest anyone forget that we are in modern commercial times, Guinness (one of the festivals sponsors) has its logo on both knights’ armor. When most people see Jillian Scott’s horses they do a double-take. 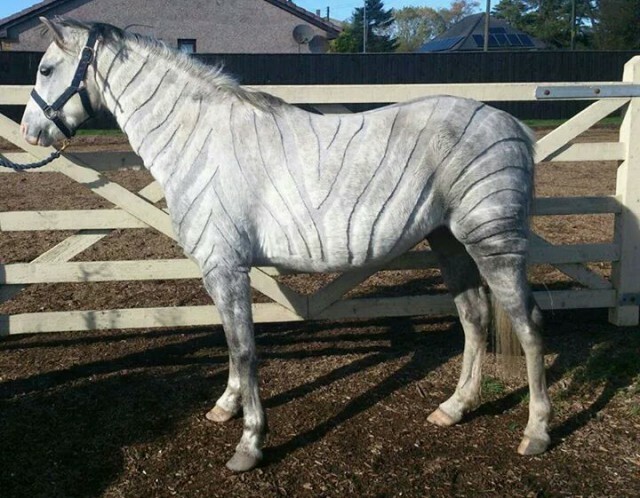 Is that really a zebra in North Lanarkshire, Scotland? Nope, it’s part of Scott’s art — but the canvas she uses isn’t paper or linen; it’s the bodies of horses. From shaving giraffes to dragons to Batman, this is the realm of creative clipping. And some of the designs are crazy. For customers Scott has shaved everything from a skeleton to the Minion from Despicable Me on a horse’s rear — a type of clip called a “bum patch” that’s increasingly popular wIth people who don’t want to commit to a full-creative groom — to a One Direction logo onto a pony. But her favorite designs is her leopard print. 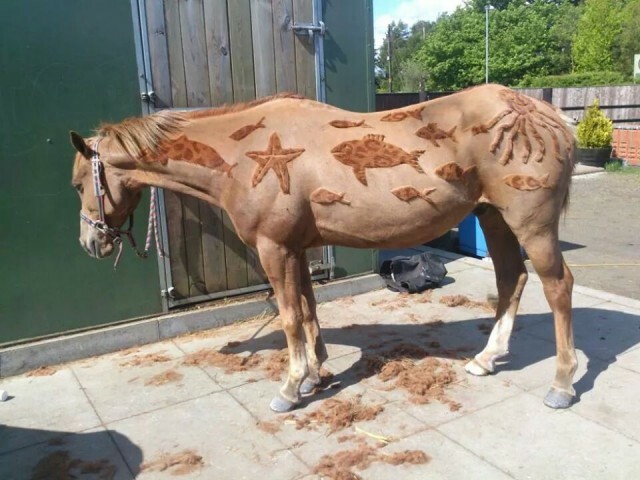 A horse groomer for ten years, Scott, 27, started experimenting last year: she took out her clippers and carved a zebra pattern into her horse, a job that took around three hours, with breaks to consult images on her phone to make sure she had the pattern right. The same clip now takes her 45 minutes. Her work started getting her local attention — some positive, some not so friendly. “Some people don’t like new things,” she shrugged. She charges $63 for a “regular” clip and $78 for a creative clip. 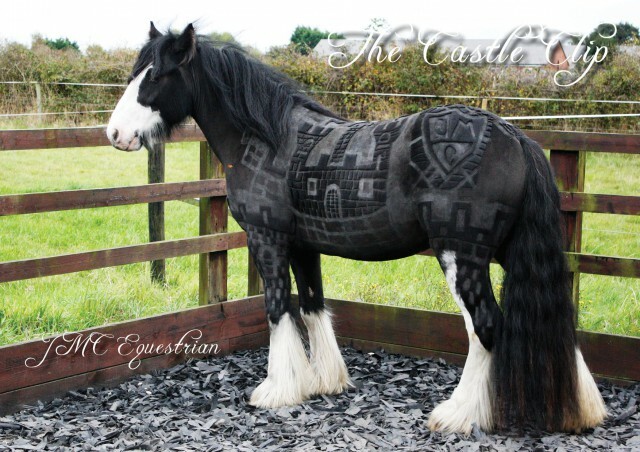 Scott isn’t the only groomer using horse hair as artistic medium. 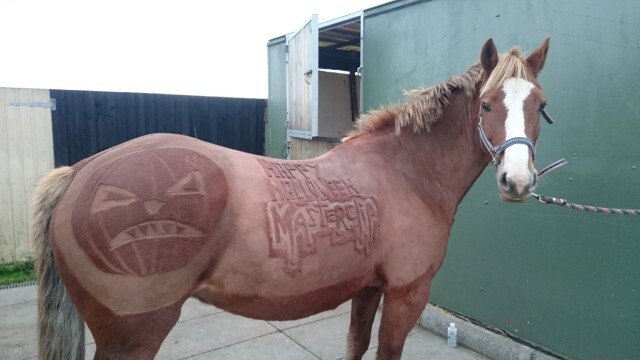 Melody Hames, 28, a graphic design student at the University of Salford, Manchester who works at JMC Equestrian, wanted to combine clipping with her art. Pit Bull dogs tend to have a public image problem. They’re consistently viewed as “dangerous dogs”, and regularly vilified by the media. Other breeds get a bad rep as well; rottweilers, and boxers also fall into the perceived danger dog category. Yes, some of these dogs have done the things they’re accused of; – one of the most recent high profile incidents being that of Mickey, an Arizonan pit bull who mauled a 4 year old child. If this had happened a few years ago it’s pretty likely that Mickey would have been put down, but instead he was given a prison sentence. Yes, a real one. The dog was charged to be neutered and defanged, sentenced to live in a no kill animal shelter inside an Arizona prison. Bizarrely, Sheriff Joe Arpaio, (he of the angry views on immigration) was behind this odd dog life sentence. Artist Douglas Sonders has been working to change the public perception and opinion of pit bull’s as dangerous dogs, and cases like Mickey might suggest that his work has been reaping benefit. 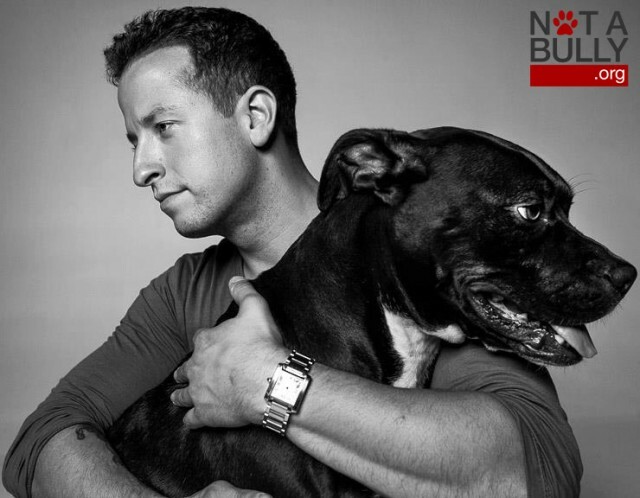 Sonders has been working toward since 2012, when he started the “Not a Bully” campaign, to help humanize the “dangerous dogs” breeds. His journey started at a Petco adoption event. Sonders had been mourning the death of his pet boxer, Winston Churchill, after an aggressive tumor took his life. He felt he was ready to love again, and wanted a pet that he could connect too. 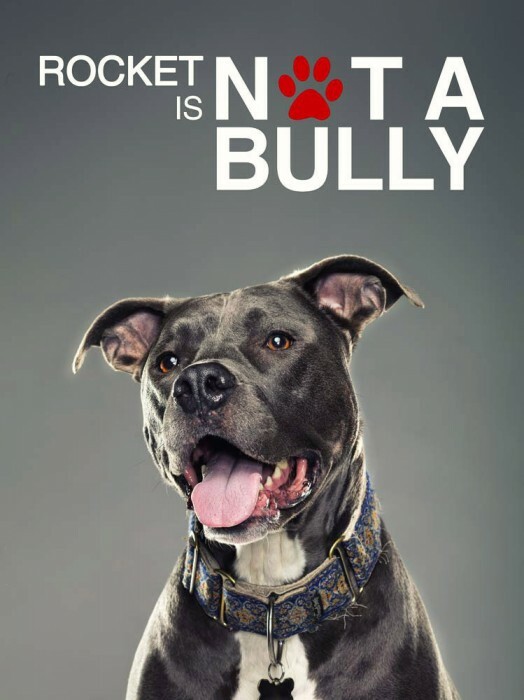 To help change the negative perception of pit bulls and other dangerous dog breeds, Sonders created the “Not a Bully” campaign. This campaign uses Sonders skill as a photographer to show pit bulls in a very different light. Forget those images of slavering jaws and crying toddlers, he shows the dogs as they are, removed from negative stereotypes. I knew that when I moved to America I would be privy to all sorts of things that had previously existed in fiction . 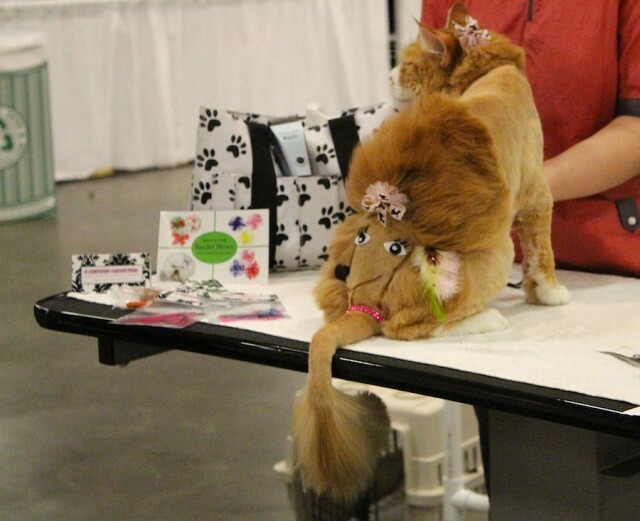 I’d heard of creative grooming for dogs, but creative cat styling, a.k.a feline fantasy competitions were a whole new arena. It’s not easy turning a cat into a flowerbed. Or a devil. Or the pink panther. 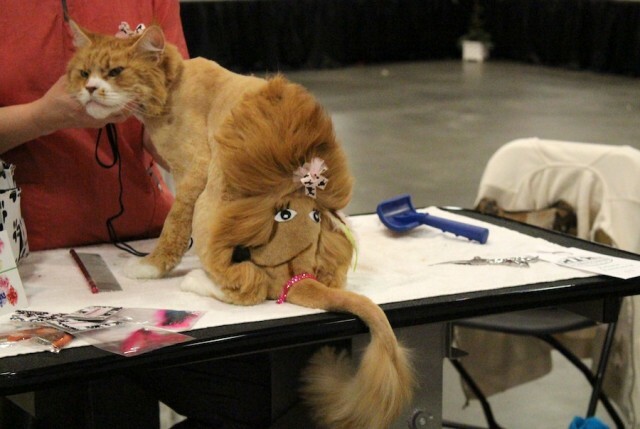 But for extreme cat groomers — a growing community of pet stylists who compete on a national circuit — the transformation of felines with clippers and dye is worth the long hours of painstaking effort. 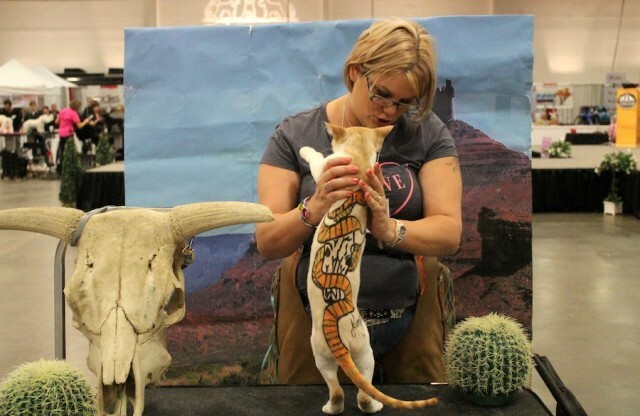 In the past twenty years, extreme pet styling has gained some acceptance in the dog grooming world, encompassing seven large scale competitions in the U.S. 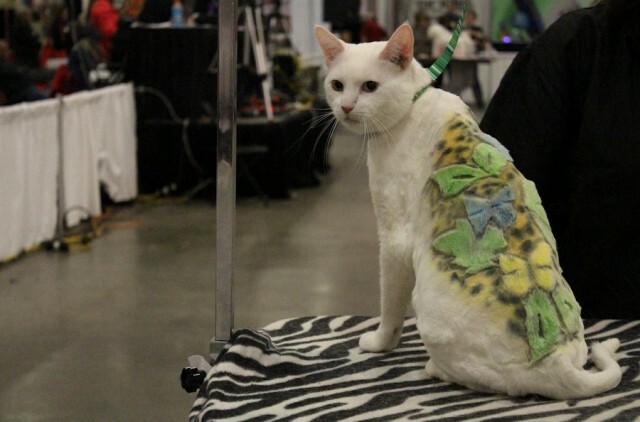 The cat world however, is new to this phenomenon and stylists are struggling for acceptance. 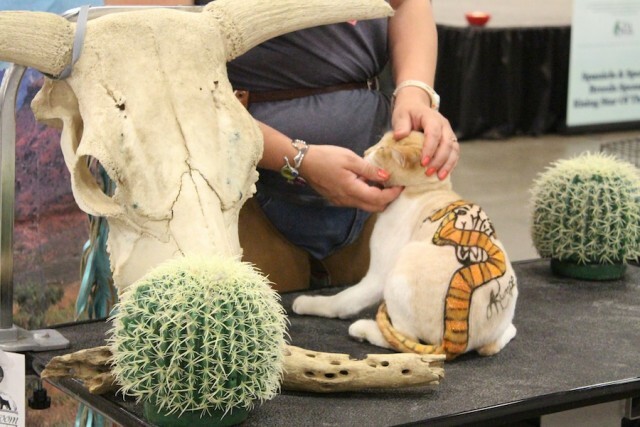 Two organisations- the National Association of Professional Creative Groomers and the National Cat Groomers Institute of America- offer education and training in how to apply creative color. They try and counter PETA’s claims of cruelty with information, but can this battle be won? 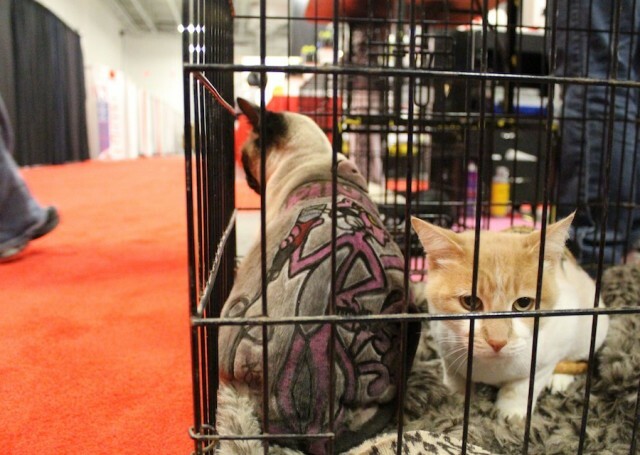 These images were taken at Intergroom 2013, an annual animal grooming exhibition in Meadowlands, New Jersey. The cat groomers follow strict rules to make sure that the cats are safe. 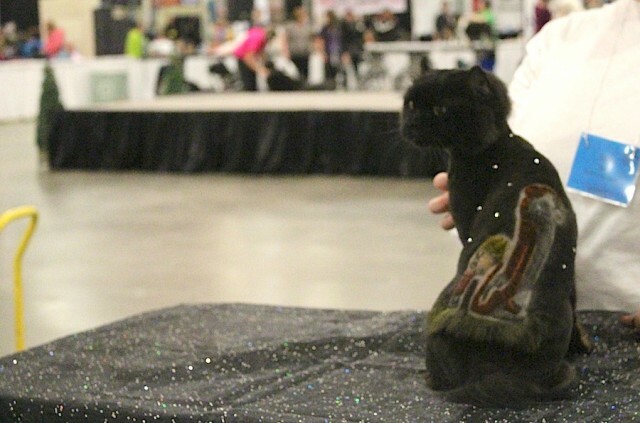 These include using, “Non-toxic, cat safe color and glues,” and making sure the cats are already groomed before the show. This means that the cats come fully designed, and only touch ups are allowed, potentially so the cats don’t get uncomfotable by all the noise – and all the dogs around. 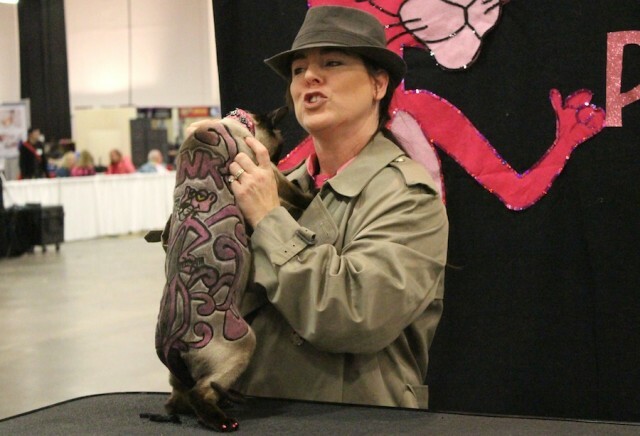 Christine de Felippo, producer of Intergroom said that these “feline fantasy” competitions have been happening since 2003. 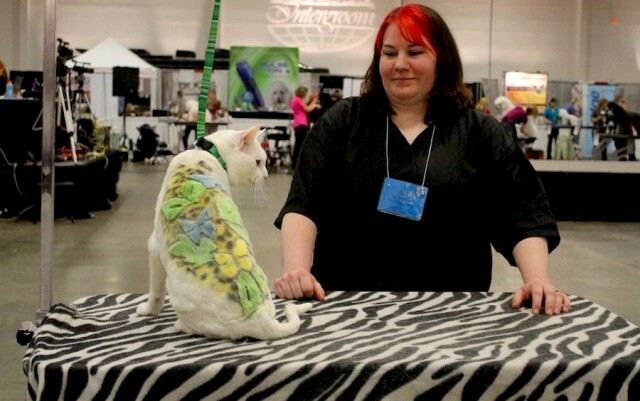 “It was our pleasure to introduce the very first Cat Grooming Competition at INTERGROOM 2003. It was met with great interest, several brave groomers, an enthusiastic Sponsor in Kim Laube, and a perfect Judge in Shirlee Kalstone,” she wrote on Intergroom’s website. The competition went on gold for a few years but then started up again, and 2014 saw more entries than the year before. The designs were very striking and I was amazed by the creative vision of the artists. This is definitely still a small field, a sub-subculture of a subculture, and though it is animal friendly inasmuch as the dyes are safe and the cats are cared for, it’s still hard to know whether the cats enjoy it. SIDE NOTE: I’m starting to think I should have a ‘animal’ section of this website, as in the past few months it seems that a lot of these types of stories are coming up. What do you think? People love their dogs a LOT . We know this to such an extent that we don’t even need to qualify the statement anymore. But when does dog love turn into needing to let your pet live in a replica of a British double decker Red Bus? 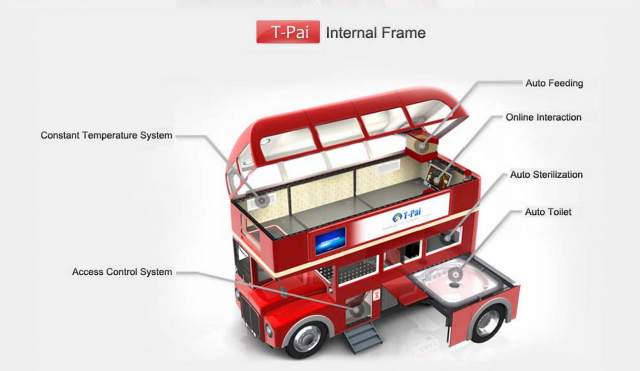 Chinese company, Hong Kong Tesla Technology Limited (HKTTL) thinks this is just where your pooch wants to stay, and it’s not a simple red bus, it’s a smartbus codenamed the T-Pai that we’re talking about. Not only does your BFF get to live a’la Queen Liz (on her day off when she’s slumming it) but every single need your dog might have is automated. An automatic feeder releases food and water at set times and can be controlled remotely via cellphone. The T-Pai has enough space for a weeks worth of food; so if you go walkies, they don’t go hungry. 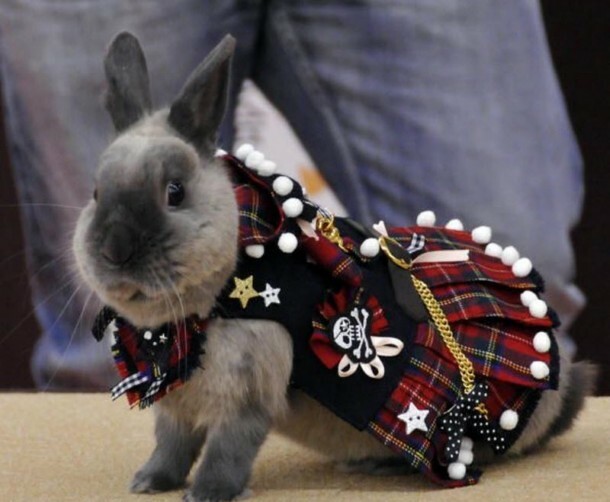 Can somebunny share the love for Rabbit Fashion Week? In recent years I’ve noticed a trend towards pet owners taking various animals and dressing them up in costumes. 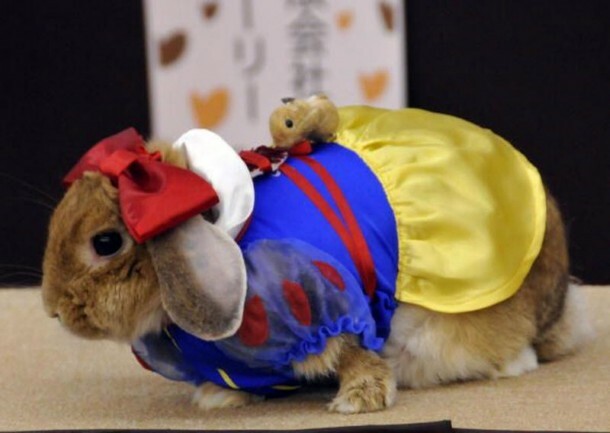 I just discovered the Japanese Rabbit Festival, an annual event where bunnies are dressed up in all types of couture and make their adorable flip floppy way down a rabbit runway, as part of a two day rabbit fiesta. As far as I can ascertain (Google translate Japanese is a little hairy) each Rabbit Festival follows a particular theme, and the bunnies are adorned to match. The festival is about more than just the rabbit fashion show, as there are hug a bunny workshops, video diaries of bunny activity and rabbit accessories to buy. People who visit can come WITH their own rabbit, and it sounds like a strange but sweet meetup. 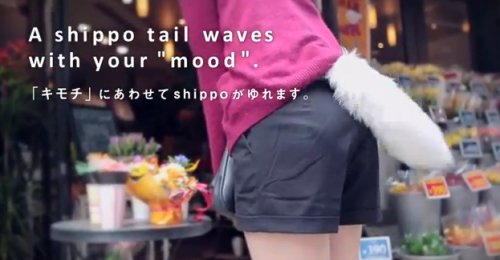 Introducing the Shippo, the gelocated fluffy kitten tail designed to be worn in public to display your emotions (by waggling) and display your location (for the parents who aren’t happy you’re wagging your tail in public). If this sounds confusing, let me break it down for you. The Shippo is a pin on tail that you attach to your behind, and syncs with a neural sensor that you place on your forehead. The neural sensor syncs with the tail and supposedly ‘activates’ it based on your emotions. The idea is that if you’re feeling happy/joyous/ embarrassed to be wearing a fluffy kitten tail in public that the tail will move in time with your neural brain waves. The tail has three settings, and will wag slowly if you are relaxed and speed up as you get excited/frustrated/drunk. 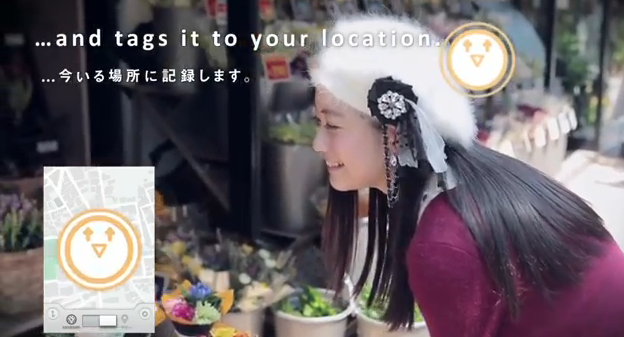 There’s more to the Shippo tail than simply serving to create a scene wherever you go- the sensor that you wear also connects to the Shippo smartphone app, which will tag your location AND your mood to the places you visit.